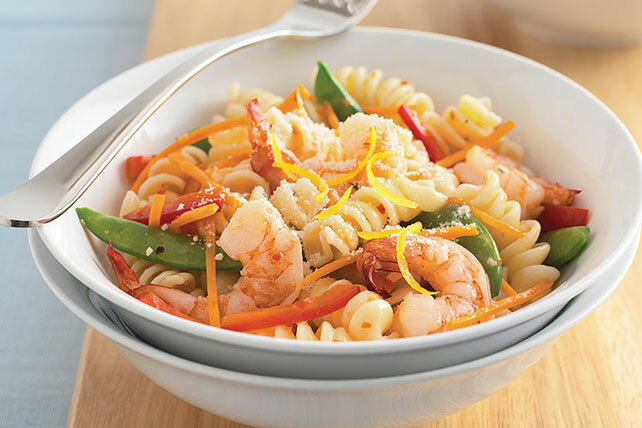 A springtime mix of fresh veggies gets tossed with pasta and topped with Parm for a 25-minute dish that’s loaded with flavor. Zest a little lemon for the finishing touch. Meanwhile, heat dressing in large skillet on medium heat. Add shrimp, vegetables and garlic; cook and stir 3 to 4 min. or until shrimp turn pink and vegetables are crisp-tender. Drain pasta; toss with shrimp mixture. Sprinkle with cheese and lemon zest. Substitute boneless skinless chicken breasts, cut into bite-size pieces, for the shrimp. Prepare using whole wheat rotini pasta.